ST SIMON’S ISLAND, Ga. — Every year, Stiles Kellett enters the Rich Products Golden Isle Red Trout Classic. Sure, he is motivated by charitable purposes — the Redbone Series event is designed to “catch the cure” for cystic fibrosis — but like any competitor, he wants to win. Kellett catches a 24-inch trout. After falling short numerous times, Kellett finally cashed in Saturday, leading his two-angler team — which included Aaron Bishop — to the victory with 5,500 points. The event was scored based on catches of trout and redfish and was part of the second year of the Built Ford Tough ESPN Outdoors Saltwater Series presented by TakeMeFishing.org. The ESPN Outdoors Saltwater Series continues to integrate Redbone events into its tournament structure. After struggling with redfish on Friday, the trio was able to land six reds right off the bat Saturday. The early start provided a slight cushion for the champions but did nothing to diminish any of their competitive juices. While the victory was nice for the whole team, each kept top of mind why they were competing. One of the co-chairs of the event, Cal Collier, has a son who has Cystic Fibrosis, William. Eight-year-old William competed both days, landing a trout Thursday that was big enough to be scored. Owens and many others in the field are tight with the Colliers and with more events like these; they are looking to do their part to find a cure. Just like Friday, Owens piloted the boat south to an area in Christmas Creek in search of trout after working the reds in the morning. The bite wasn’t nearly as stout as Friday but both Kellett and Hastings were able to remain patient and land fish often enough to stick with the area. Owens said that the key to finding both species was identifying clear water. Saturday, with the tides changing courses and staying low, clear water was much easier to locate. Still, the bite remained tough. This was the fifth event of the ESPN Outdoors Saltwater Series. 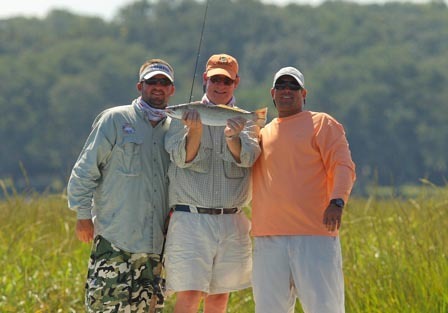 The 2009 EOSS season will culminate with the Redbone Celebrity Tournament out of Islamorada, Fla., on Nov. 6-7.